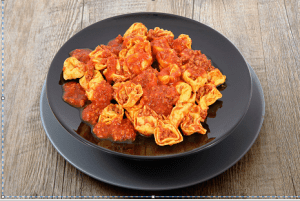 Ragù Tortellini mixes best two dishes of Italian culinary tradition: the Emilian tortellini and Bolognese ragù. Tortellini, both in broth and ragù, are a dish known all over the world: a thin dough of pasta that contains a filling of meat and parmesan for a first dish that conquers everyone! To make the tortellini to the sauce first prepare the sauce: clean and chopped celery, onion and carrot. Finely cut the bacon and sprinkle it with extra-virgin olive oil in a saucepan together with the ground beef. When the meat is well browned add the spices, and bake for 5-6 minutes. Then blend with red wine. Set salt and pepper, add the tomato concentrate and finally the tomato paste. Let bake the sauce for about 1 hour and a half on low heat. Cook the tortellini in plenty of salted water, drain them and season them with the prepared sauce and a sprinkling of Parmesan cheese.